Jiangmen Yingtong Packaging Co., Ltd.
Wenzhou Flowpack Machinery Co., Ltd. This 26 pieces set comes with all the balloons and decorations you would need without putting a hole in your wallet. Tie a weight at the end of the helium-filled balloons so they don&rsquo;t float all around the room. We can provide one-stop service, from the mold design, mold manufacturing and production delivery. Foshan Shunde Pingroun Food Development Co., Ltd.
New Design Mini Animal Squishy Toy 3D Kawaii Animals Eco-friendly Soft Mochi Squeeze Squishy Cat Toys Easy to put on and take off, suitable for adults, kids, widely use in Public. Logo way no Packing 1pc per poly bag or custom packing MOQ 100pcs Production time 10days for quantity under 2000pcs Ship way DHL, Fedex, UPS, TNT, air, sea as per request 6. Other Hot items for reference: Welcome to contact us now. 1 minute enquiry, 100% worth for you !!! Specifications 1.Factory based price 2.EN71 ASTM 6P HR4040 certificate 3 . Sample is available Factory wholesale soft 3D animals toy anti stress mochi squishy Item No. : CJ-1216680 Package: OPP BAG Product Size: 7.00&times;6.00&times;2.00 CM Carton Size: 76.00&times;30.00&times;30.00 CM Q'ty/Ctn: 600/ PCS G.W./N.W. 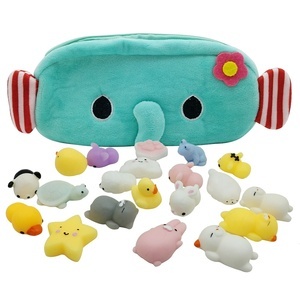 Ningbo Best Toys Co., Ltd.
Alibaba.com offers 1,185 mochi bags products. About 52% of these are other toys & hobbies, 7% are packaging bags, and 1% are handbags. A wide variety of mochi bags options are available to you, such as free samples, paid samples. There are 1,111 mochi bags suppliers, mainly located in Asia. The top supplying countries are China (Mainland), Japan, and Taiwan, which supply 94%, 2%, and 1% of mochi bags respectively. Mochi bags products are most popular in North America, Southeast Asia, and Western Europe. You can ensure product safety by selecting from certified suppliers, including 155 with Other, 55 with ISO22000, and 53 with HACCP certification.